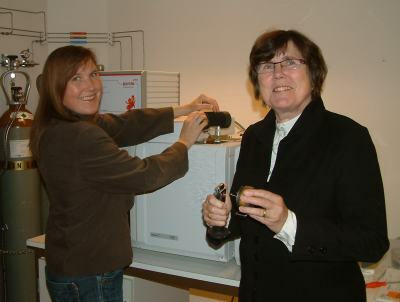 Helena Jönsson and Inger Ericsson, Pyrol AB. Pyrol AB was established in 1984, based on the findings in Inger Ericsson’s doctoral thesis from 1975, “Qualitative, Quantitative and Kinetic Studies of Salts and Polymers with a New Pyrolyzer in Combination with a Gas Chromatograph”. Realizing the limitations and imperfections of other pyrolysis instruments, Inger Ericsson developed a new pyrolyzer with extremely fast temperature-rise-time, 8 milliseconds to reach temperatures up to 1400 ºC, for samples sizes in the order of micrograms. This together with a unique non-interfering temperature measurement made it possible to develop the innovative methods, thermal desorption, sequential pyrolysis, fractionated pyrolysis and pyrotomy. Helena Jönsson succeeded Inger Ericsson as CEO of Pyrol AB in 2010.